This is the fourth chapter in the story about a great egret that we gave a GPS tracking device on the Outer Banks of North Carolina in spring 2013 (see photo). We followed his movements for about 8 months and reconstructed his story with his GPS and ACC data (see parts I, II and III). Mr. Bisbing, a great white egret with our tag on his back. On October 24th at 9 p.m., Mr. Bisbing took off for his last long trip. Up to that point he had spent his summer within the Outer Banks, breeding and raising chicks with a mate, then taking it easy in the wetlands south of Roanoke Island. Everything seemed to be orderly and his daily routine was relaxed and regular. As temperatures got colder toward the end of September, he started becoming a bit unsettled. He checked out new foraging areas, drifted farther and farther south, but still returned to his roost every night. Eventually, he overcame his inhibitions and took off flying south away from the Outer Banks, over the open ocean. During his migration, Mr. Bisbing covered a total of about 3200 km (2000 miles) (Fig. 1). He started with an impressive 22.5-hour nonstop flight (from Oct. 24th, 9 p.m. until Oct. 25th, 7:30 p.m.) from his roost south of Roanoke Island straight across the ocean to the Bahamas, where he took his first break. During this first nonstop stage he covered more that 1200 km (about 755 miles)! Figure 1. Mr. Bisbing’s migration from the Outer Banks of North Carolina to Colombia. Yellow circles mark his resting areas. But why do egrets migrate at all? Bird migration is the regular seasonal movement, often like in our case, north and south along a flyway between breeding and wintering grounds. Migration carries high costs in predation and mortality but many species of birds have to risk it because of the availability of food. Great egrets like Mr. Bisbing feed on fish and other small vertebrates such as amphibians, reptiles and mice. During winter all these vertebrates appear less abundant, because many of them hibernate. So egrets need to find foraging areas with higher abundances of their preferred food. Timing of migration is controlled primarily by changes in day length. For navigation birds often use celestial cues from the sun and stars, the earth’s magnetic field, and probably also mental maps. Mr. Bisbing flew across the ocean, during the night, so we can assume, that he had no visual orientation to navigate. Nevertheless he found his way back to a shore and foraging grounds to regain some strength. We were quite surprised to observe that when migrating, Mr. Bisbing was flying actively, flapping his wings nonstop, without soaring as birds of similar size and body shape like storks or cranes do (Fig 2). Figure 2. Mr. Bisbing’s first stage of migration south. 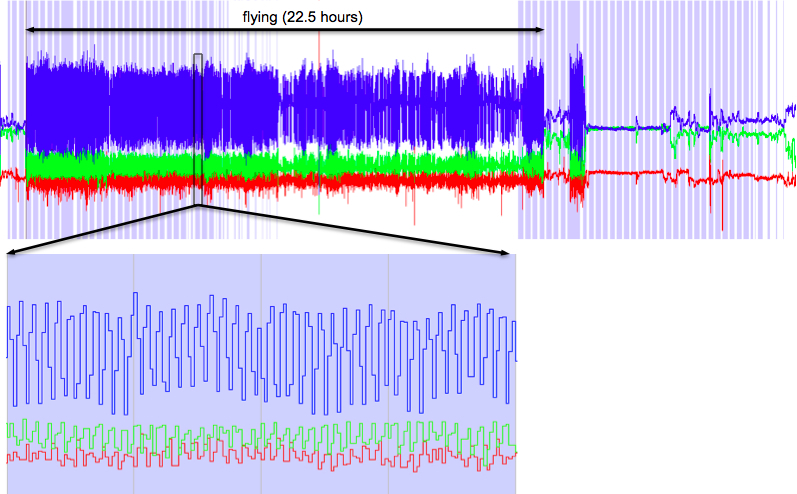 Close-up shows wing beats, grey bars show nighttime. After his first landing in the Bahamas, he rested for only 80 min before he flew farther south for another 35 min. Here, in the south of Greencastle, he found a wetland and rested for the rest of the night. He slept-in the next morning and took off at 9:40 a.m. to forage in the surroundings. But he took only one day to recover from the long and exhausting flight, spending his time resting and foraging (Fig. 3). Figure 3. 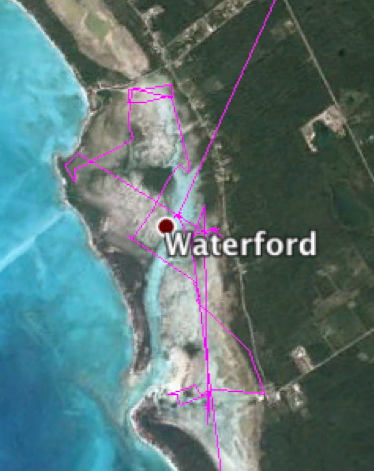 Mr. Bisbing’s foraging tracks (pink lines) in the Bahamas on October 26th. Why Mr. Bisbing didn’t stay in Bahamas longer we will never know, but in the evening of October 26th at 8:00 p.m., he flew another 435 km (270 miles) south over the Caribbean. It took him 6 hours, and by 2 a.m. he reached the northeast coast of Cuba. He rested there for a few days in a quite regular daily pattern, as he used to do before the migration: waking up at 7 a.m. and spending the day foraging until 8 p.m., when he went to bed at his roost (Figs. 4 and 5). Figure 4. Mr. Bisbing’s normal daily routine with foraging and resting, in this case during a migration stop-over in Cuba. Our ACC data record ends on Nov. 2nd at 1 a.m.. We were not able to download any data from the memory card during Mr. Bisbing’s migration, so the ACC memory card filled up and stopped recording. From now on, we don’t have any more details about his body movements, but we could still follow his regional movements, because the GPS was still working. The resolution was lower, due to the memory limitation, but we received a few points every day to follow his large scale movements. Figure 5. 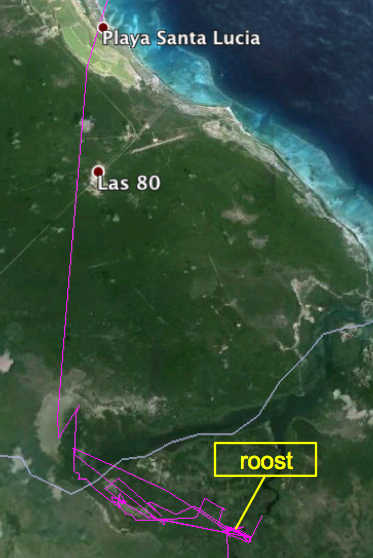 Mr. Bisbing’s foraging tracks (pink lines) in Cuba. After 20 days in Cuba, Mr. Bisbing was on the move again, migrating 400 km (about 250 miles) farther south to Jamaica on November 15th. He found a roost south of Pamphret (Fig. 6) and stayed in this area for almost two weeks, until November 27th. Figure 6. 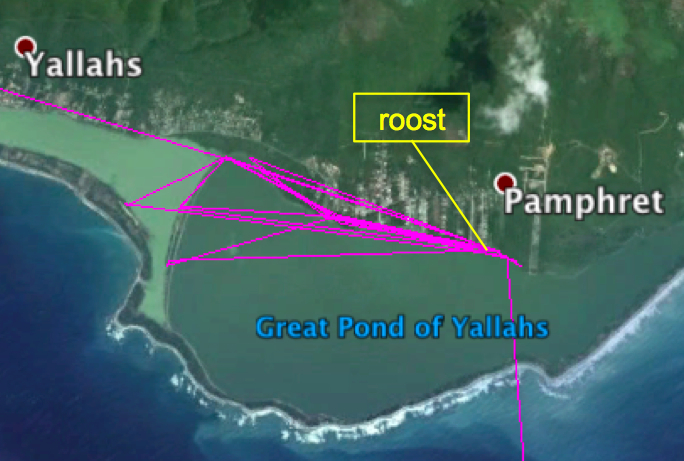 Mr. Bisbing’s foraging tracks (pink lines) in Jamaica. The next data we received are from November 29th, and at this time, Mr. Bisbing is already in 960 km (about 600 miles) farther south in Colombia, south of Momil in Cordoba Province, where he stayed for another day. From there he flew another 212 km (133 miles) farther northeast, to Cesar Province. The GPS tells us that he arrived here on December 2nd and he stayed and foraged in this area for another couple of days – until his movements stopped on December 8th. This was the last step of his migration, indeed, the last flight of Mr. Bisbing. 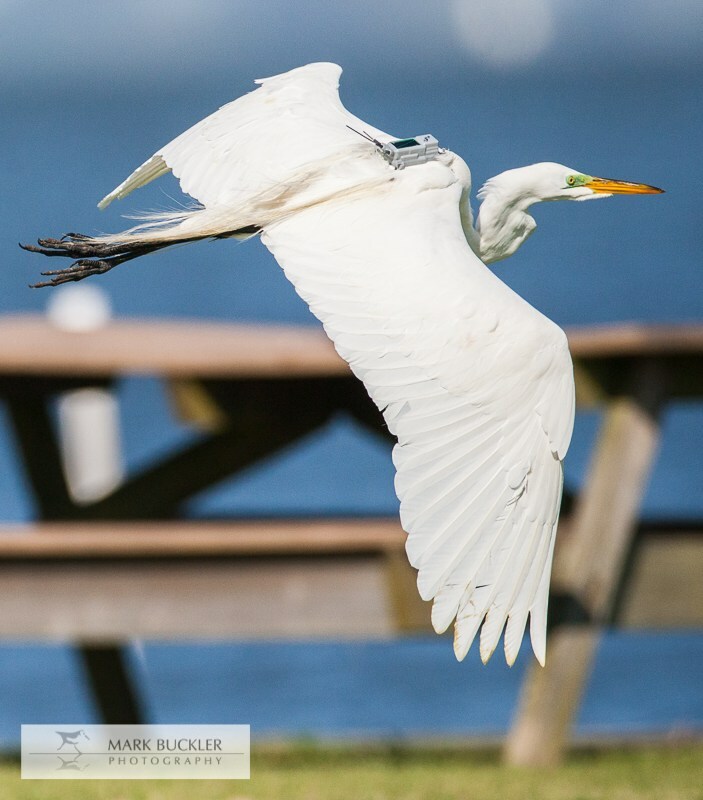 What happened next to our tragic hero, and how we got the tracking tag back from South America to North Carolina will be the subject of our final blog post about Mr. Bisbing the great egret.